Being someone that follows a whole food, plant-based lifestyle, I’m used to people questioning, poking fun, and full-out gawking at my eating habits. Take, for instance, my two week-long work orientation. We jet-setted to a land far away from Pittsburgh to live out of a suitcase for 14 straight days. While I definitely learned a lot, I sure did miss my bed, my boyfriend, and my food. One thing that never got old, however, was sharing my food philosophy with others. No, I didn’t shove it down people’s throats, but when they asked why I was passing up the ground beef and big bowl of queso for lunch, I was happy to share my thoughts. Honestly, most people called me a rabbit. They didn’t understand how I could opt for seconds of that yummy kale salad or a big juicy Gala apple instead of chocolate cake or root beer floats for dessert. They laughed over how I would gush over the bean sprout tacos I had while I was there. Which were AMAZING, by the way. I love talking to people about stuff like this. When they find out that you can make yummy coconut cookies or chewy lemon scones healthy, they’re at least intrigued with this “classic recipes made healthy” philosophy of mine. I know this lifestyle isn’t for everyone, but if people start to understand my choices and maybe consider a whole food treat over a processed one? I’d consider it a win in my book. That being said: There’s no way to get around the fact that, when you tell someone that you made secret ingredient chocolate pudding and that “secret ingredient” is avocado, you’re bound to turn some heads. 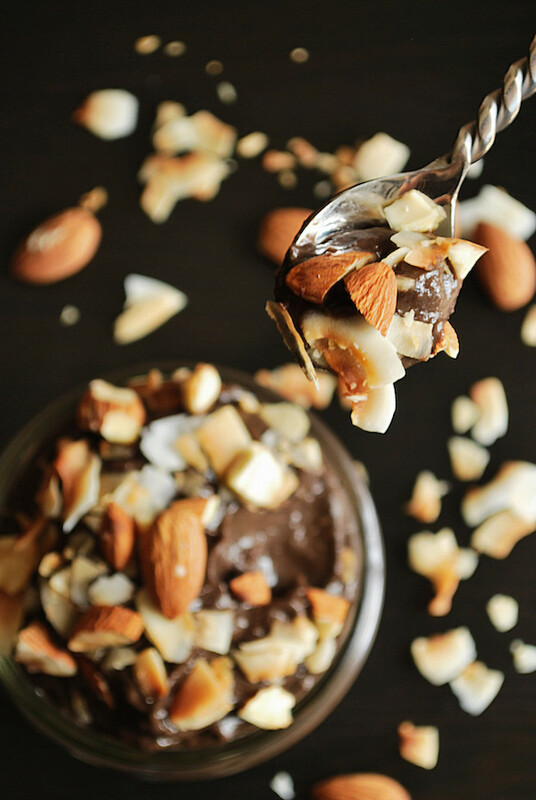 Yes, this Almond Joy Chocolate Pudding is made with a whole avocado. But it also has chocolate! Almonds! Toasted coconut! And a whole mess of healthy whole foods! I’m telling you, you’ll be addicted at first bite. Make sure your avocado is ripe: there ain’t no way it’s going to blend if it’s as hard as a rock! Use dark cocoa powder: I use Hershey’s Special Dark, which is found at most mega-marts, or Penzey’s Dutch Process Cocoa. The rich cocoa-yness of this type of cocoa powder does a bang-up job of covering up that avocado flava! Toast that coconut: I posted a handy-dandy How to Toast Coconut in 5 Minutes tutorial on Monday, so be sure to check it out for the optimal coconutty taste! 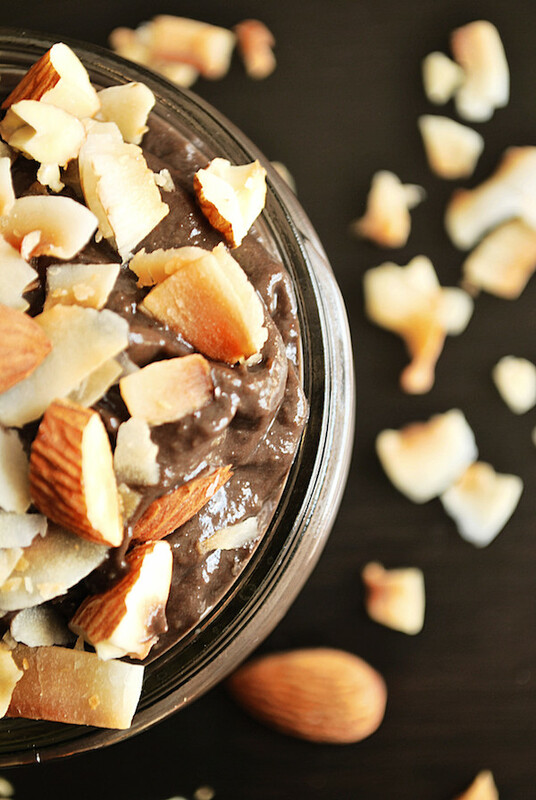 Let it sit in the fridge…overnight: Yes, it may be the hardest dang thing you’ll do this week, but this Almond Joy Chocolate Pudding needs a nice chill in your fridge before consumption. Yes, you can give it a try at room temperature; however, I found that all of the flavors melded together much better after a quick chill. 7 healthy ingredients, 1 indulgent creamy rich treat! We love this Almond Joy Chocolate Pudding in the Fooduzzi household, and I know it’s bound to become a favorite in yours. Enjoy this treat for dessert, a snack, or even for breakfast; a “candy bar” pudding breakfast…I’d say this whole plant-based diet thing is pretty dang cool. Pit and peel the avocado, and place it into a food processor. Add cocoa powder, milk, almond butter, and maple syrup, and blend until completely smooth. Scrape down the sides as needed. 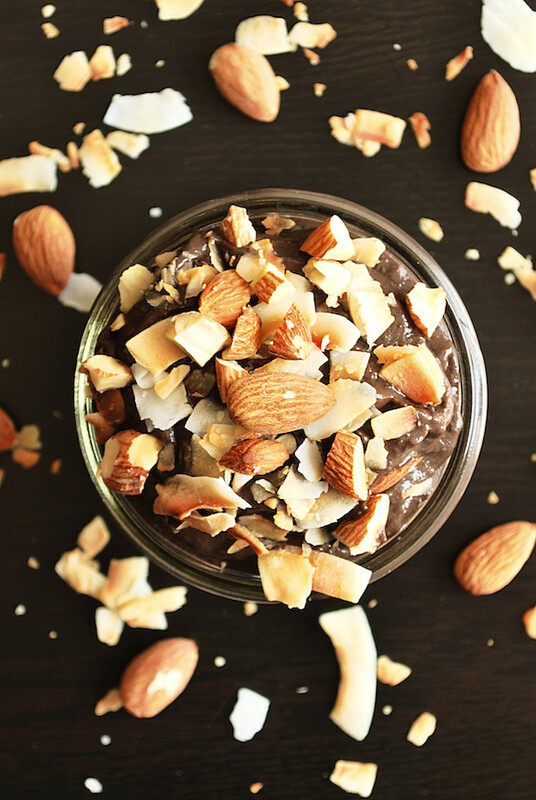 Scoop chocolate avocado pudding into a small bowl or container and mix in coconut and almonds. Cover and place in the fridge to chill overnight. Don’t know how to toast coconut? My “How to Toast Coconut in 5 Minutes” tutorial couldn’t be more simple! Yum! I LOVE avocado in puddings! I always get comments on what I eat too, but you’re right that it’s a good opportunity to introduce people to healthier eating! I tried avocado pudding for the first time a couple months ago, and I was kind of blown away! Can’t wait to try at home! Right?! I’m right with you, Dani! I’m shocked at how sinfully creamy it can make such a healthy dessert! I’ve been wanting to try avocado in pudding for a while now but I’m still a bit apprehensive – which is silly because the worst thing that could happen is that I wouldn’t like it :P These pictures may just push me over the edge! If I make them this morning … then by this evening they’ll have been in the fridge ‘overnight’ right? Right?? Sophie, you MUST give it a try! And I think your pudding would be make a divine dessert if you stick it in the fridge this morning! Good luck, and let me know what you think! I can relate SO much to your experience with your coworkers. I get a lot of comments on the way I eat at work, and it can feel a little uncomfortable sometimes because it’s usually judgmental (there’s not too many health-conscious vegetarians in North Carolina haha). But once I explain all the things I CAN and DO eat, it usually gets a little bit easier. And the fact that I wake up feeling like a million dollars every day (instead of like crap) is such a win! Thanks for posting this! PS avocado makes the BEST mousse! Can’t wait to try this! I adore avocado in my chocolate pudding. It makes it so creamy and rich without unhealthy fat added! This was the first time I had tried avocado in pudding, but consider me a convert! I’m right there with you, Nicole – I’m addicted to the richness the avocado brings to this dessert!